A delicious powdered Lemon and salt seasoning in a packet that adds an irresistible tang of citrus and dash of salt to snacks and beverages. Limon 7 is a salt and lemon powder that has a delicousy tangy taste that will make your mouth water. The powder can be eaten straight from the packets or sprinkled onto a variety of fruits for a perfection combination of sweet and sour flavors. 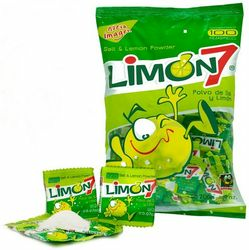 Limon 7 - Polvo de Sal y Limon Dulce Mexicano Limon 7 es un polvo de sal y limon que tiene un rico sabor salado y dulce que te hara agua la boca. El polvo puede ser comido directamente del paquete o rociado encima de una variedad de frutas para crear la combinacion perfecta de sabors dulces y salados. Ingredientes: sal yodada, acido citrico, azucar, limon natural deshidratado, estearato de calcio, goma arabiga y colorante natural curcumina. I guess I'm the oddball in the group. I would just eat these straight up no drink or even put it on fruit. It's sour and tasty but I guess not for the faint of tongue. Packets are good to carry around. LOVE IT !!! Love putting a packet of this in Corona Extra with some Lime Juice (from actual Lime NO BOTTLE) .... Best Ever!!!! good stuff, not just for fruit, can be used for margarita glass rim or with shots of Tequila!! Just what I expected it to be, it was great and the same taste and everything the sam as when i was back home, and just this time shipped straight to the door, dont have to go from store to store or to mexico looking for it.